Eric Baudelaire, Letters to Max, 2014. 103 minute film projection. 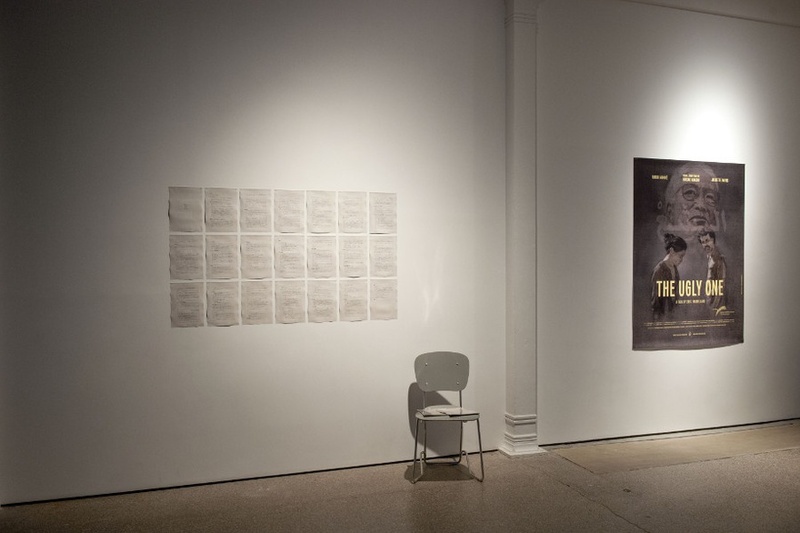 Installation view, The Secession Sessions exhibition, Berkeley Art Museum/Kadist Foundation, San Francisco, 2015. Visual artist and filmmaker Eric Baudelaire talks to Anthony Downey about the themes of disjunction, the real, and the representation of the ‘event’ in his work. Tracing the development of his career from the social sciences to the field of art, as inspired by his time in the de facto state of Abkhazia, Baudelaire describes the convergence of his different interests in sound, image, oral history, and the unpacking and problematizing of historical narratives. Screenwriter and ex-Japanese Red Army spokesperson Masao Adachi emerges as an influential figure in both Baudelaire’s artistic practice, where their collaborations produce a unique creativity out of artistic conflict, as well as shared trans-generational attitudes towards the art and politics of the future. Anthony Downey: Let’s start with Letters to Max (2014), a film about a series of letters that were sent to Maxim Gvinjia, a diplomat in Abkhazia, which is a contested country on the eastern coast of the Black Sea. The film speaks to a certain aspect of your practice: a disjuncture created in the film between the letters going out, the recorded responses, and the filmic experience that happened after the event of exchanging the discourse. Eric Baudelaire: Abkhazia is important for me because it is the place where I decided to stop being a social scientist and become an artist. It is an unrecognized or de facto state, which means that it exists de facto but not de jure. This has been the case since 1992/1993 when it seceded from Georgia in the aftermath of the Soviet collapse. It was around that time 15 new nations were breaking apart from the Soviet Union. There are some other states that emerged that were more in the grey areas, on the borderlines that separate other states, such as Transnistria in Moldova, Nagorno-Karabakh in Azerbaijan, and in Georgia there was the breakaway region Abkhazia. I was about 27 years old when I first went there with my childhood friend Dov Lynch, who is one of the pre-eminent scholars in post-Soviet studies and who was working at Kings College in London at the time. We were in London in 2000 and Dov suggested we visit these unrecognized states. The idea was a journey between a writer, Dov, and a photographer – I was starting to take pictures and was becoming interested in documentary photography. We had a James Agee and Walker Evans-style romantic notion that we would travel to several of these unrecognized states and try to understand what was happening there: How can a state be both a place that exists in a physical sense but not exist in a political sense? What are these no man’s lands and what do they look like? How do people live in them? That was the genesis of the project, which is now 15 years old. It was in Abkhazia that I realized the limitations of some of the theoretical tools that I had been trained to utilize in my understanding of the world as a political scientist. So I became interested in seeing how photographs could serve as a vehicle for documenting what I was seeing and I’ve been going back to Abkhazia every few years since then. It’s been a bit like a studio in a sense – a place where my practice as an artist has developed. It’s also the place where I met Max. AD: Max was your translator who was sent out by the Abkhazian government to meet you because he spoke good English? EB: He was the most junior member of the budding Ministry of Foreign Affairs and he was sent to meet us and be our intermediary. We immediately hit it off and a friendship began. Max came to visit me a couple of years later when I was living in New York. The development of Max’s career in politics and mine as an artist happened in parallel and the film Letters to Max is one of several instalments in this relationship between us centred around Abkhazia, and probably not the last. Max was eventually appointed Minister of Foreign Affairs in Abkhazia in 2010 and for a couple of years while he was minister our friendship was put on hold – I didn’t want to interfere with his very official position. I felt that I should give him some space to do this very serious job. Later there was a government shake up and Max lost his job and, part as a joke and part as a sign that we were about to enter a different stage of our friendship, I sent him a letter in the post. Eric Baudelaire, Letters to Max, 2014. 103 minute film projection. 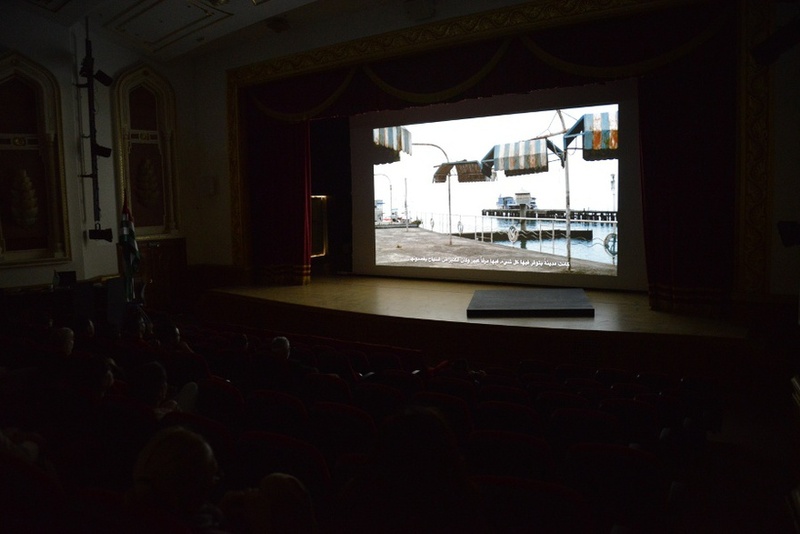 Installation view, The Secession Sessions exhibition, Sharjah Biennial 12, 2015. Courtesy the artist. AD: When did you send the first letter? EB: This was in 2012. I almost forgot about that first letter I sent him. I dropped it in the mailbox as I left the studio and all it said was ‘Max, are you there?’ I always thought about the word ‘there’ as being quite loaded in the sense that Abkhazia is there but it is equally not there. I didn’t expect that the letter would get to him. I think part of me thought that this would eventually constitute some sort of post-conceptual sculptural piece where if I wrote a letter every day for years then I would have this big pile of envelopes that would be stamped ‘country unknown, returned to sender’. So the project really began as a mail art piece. But the letter didn’t come back to the studio and about 11 or 12 weeks later I got an email from Max saying that he’d got my letter but that he couldn’t respond because the post office doesn’t work the other way around. And that’s the beginning of the film. I think there is something naturally cinematic about conceiving the screenplay of the film through correspondence, where my questions to Max provide some structure and narrative and Max’s answers, which are captured on a digital voice recorder, would become the voice over. This exchange took place for around a year. I didn’t hear any of Max’s recorded responses in that time. I like this idea of a one-way correspondence –rather than a normal conversation in which someone asks a question and someone responds and the conversation grows. In the conversation with Max, it was a one-way conversation for me and a series of one-way responses for him. A year later I heard all of the recordings and went to the next phase of the project, which was making the images and turning them into a film with sounds. AD: Max was recording his responses and storing them for you to listen to at a later date so at a certain point you must have received a cache of recordings? EB: Yes, it was six hours of recordings. Eric Baudelaire, The Anembassy of Abkhazia, 2014. Detail. 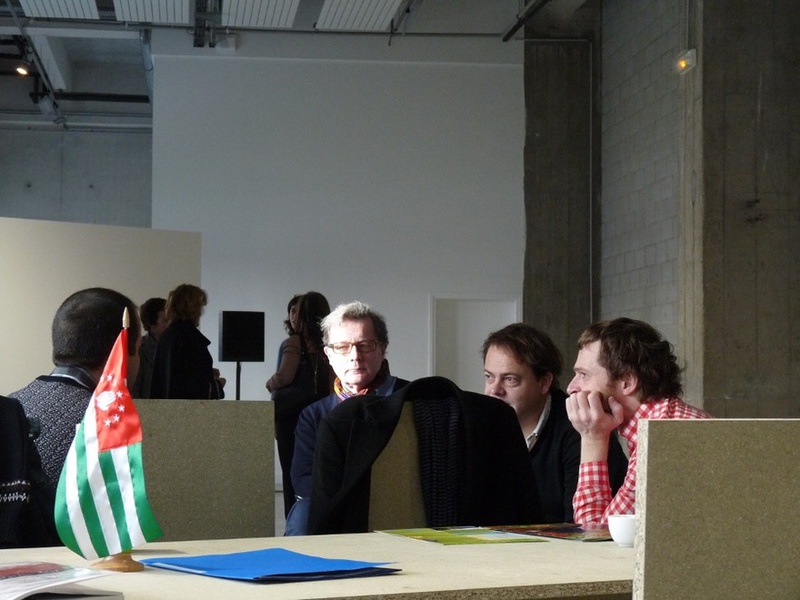 Performance with Maxim Gvindjia, Bétonsalon, Paris. Courtesy the artist. AD: Disjunction seems to exist between your use of sound and image. There is a process of displacement that you are actively working with and exploiting that seems to be a way of reimagining how you can approach the non-space or non-zone that is Abkhazia. EB: My approach to filmmaking started as the convergence of different interests that I superimposed together. One of them is oral history – I have always had a fascination with oral history as a methodology for unpacking historical narratives. I am a big believer in the art of the interview and the manner in which you can structure a conversation. I love listening to radio interviews and I think that there is something really beautiful about this dance between two people in the process of making an interview. But my interest is in sound. I have no interest in filming somebody speaking, talking heads-style. Initially, when I begin making a film, my questions are: How can you make a film from a piece of oral history? What is the significance of the image? What is its purpose? That’s how a reflection began on the use of the image as a way to support or conflict with the narrative of the oral history. This is the bedrock of a lot of my films – this disjuncture that you mention between sound and image. It allows me to do a lot of things that I wouldn’t be able to do otherwise. For example, it allows me to work with a single narrative from a single perspective but to problematize it in its relationship to the image. This works through a process of editing pictures and deciding to film certain things and then associating these images with voice. Sometimes this relationship between images and voice is illustrative but it is usually not as simple as that – there is a space that develops between the two. In traditional cinema we are used to synchronicity between sound and image – that is the foundation of the vocabulary of filmmaking. When something happens on the soundtrack it coincides with something that is happening visually. As soon as you start messing with this relationship I think you have a territory for exploration that is quite interesting. You can start to use the image to support the audio or you can use it to contradict it. AD: Or to interrogate it. EB: Exactly. You can make the spoken narrative seem more fragile, and you can create different emotional responses to what is being heard based on what is being seen. So to some extent the films have been about exploring this possibility to be at a variable distance and a variable proximity between the audio and the visuals. AD: And, interestingly, the interrogation into this relationship between sound and image creates a kind of precariousness. This sense of hiatus and suspension, to a certain extent, reflects the state of Abkhazia – a fragile space, literal space that exists but has no recognition. EB: There’s a citation from Beckett that Duncan Campbell likes to use and I think it’s very apt: ‘to find a form that accommodates the mess, that is the task of the artist now.’ I like this idea that we look at the mess of life or of politics and seek forms that are in some way adequate to accommodate this mess. In some way I think this describes the forms that my films have taken recently. Whether the mess be the strange adventure of a radical Japanese student who arrived in Beirut and decided to devote a life to the struggle of the Palestinian cause, or whether it be the very complicated status of a state that is in limbo and floats between states. These are two narratives that are very ambiguous in an ontological sense, so there is a challenge in tackling them. The forms that I’ve played with are an attempt to find a fluid manner of filmmaking that is both descriptive but leaves room for a lot of questions, and that is also undetermined because the problems themselves are undetermined. Eric Baudelaire, Site Displacement/Déplacement de Site, 2007. 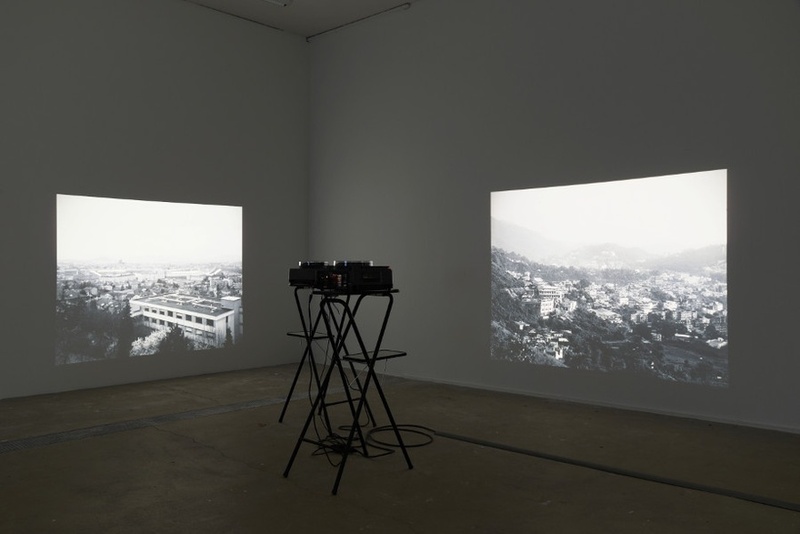 Installation view, La Photographie performe (The Body and the Archive), Centre Photographique d’Ile-de-France de Pontault-Combault, 2014. Photo: © Aurélien Mole. Courtesy the artist. AD: This reminds me of Aporias (1993), in which Derrida talks about border spaces as states of being but also as something which is full of doubt. It seems to me that the form that your films take are about convincing an audience of something that is ultimately unconvincing for various reasons. The attempt to give form is also a process of questioning that there is any form there at all. Or it revolves around something that is not there and cannot be there. Is that a reasonable way of thinking about this? EB: I think it is. There is this idea in Tarkovski’s film Stalker that the place called Zona functions outside our understanding of time and space. The Zona is also a mental space, a place where we go to realize, or perhaps seek an answer to, some of our deepest questions. So it has a lot to do with ourselves. For me, this may also be true about Abkhazia, because of the special relationship I’ve had to the place. It’s where I allowed myself to do things I wouldn’t necessarily have allowed myself to do prior to visiting: to break the rules of the social scientific method, to give up on a certain manner of Cartesian theory that seeks theoretical models that explain the real. That’s where I reached for other lenses to explain things that can’t be easily pinned down inside a framework or model or an analytical view of the world. AD: The knowledge coming out of social science is part of a figurative knowledge that is ultimately unverifiable in and of itself but that does not necessarily make it void. This makes me think of Site Displacement (2007) where you produced 22 photographs on the notion of the territory, which were then given to an Indian photographer, Anay Mann, who was charged with supplying you with a second set of images that were re-made in India. Again we have this displacement of intent of what you’re producing and it’s movement into another space, but also you’re giving up control, which creates in that moment a more speculative interjection into the real. EB: In a diptych there’s an interesting space between that dwells on this disjuncture, and that’s why the form of the is of interest to me. I also liked the idea of creating a commission within the commission. Site Displacementwas originally a commission from a city called Clermont-Ferrand, which is an industrial city in central France. It is known for being the home of the Michelin tyre factories. The Michelin family was a traditional paternalist capitalist family: they built the town, the factories, the homes for the workers, the cinemas for after work, the public gardens, and so on. AD: So it’s a kind of utopian space? EB: I’m not sure I’d use this word. I don’t know if such a thing existed in England, but in France there was a tradition of the paternalist capitalist who takes care of all aspects of the workers’ lives, arguing that this is for the wellbeing of the worker’s family. But obviously it’s also about preventing the workers from unionizing and collective organizing because the boss orchestrates their life. This paternal structure creates interesting geographies. So when the city of Clermont-Ferrand commissioned a photographic project from me they wanted me to think about the notion of ‘territory.’ At the time Clermont-Ferrand was in transition because most of the Michelin manufacturing was being moved overseas. I was really dry on this commission – it was towards the end of my work as a photographer and I just felt like I had nothing to contribute in terms of a discussion of territory and photography. I think it was a well-explored field in photography, with the New Topographics in the 1970s and 80s, and generations of other photographers before that. But then I read in the newspaper that there was a project to delocalize a truck tyre manufacturing plant and develop it as a joint venture in India, so I decided to take half of my commission and sub-contract it, in a sense, to a former student of mine who’s a very talented photographer in India. We produced this model of delocalization that also served as a manner of questioning the notion of territory in a conceptual manner rather than in a representational manner. 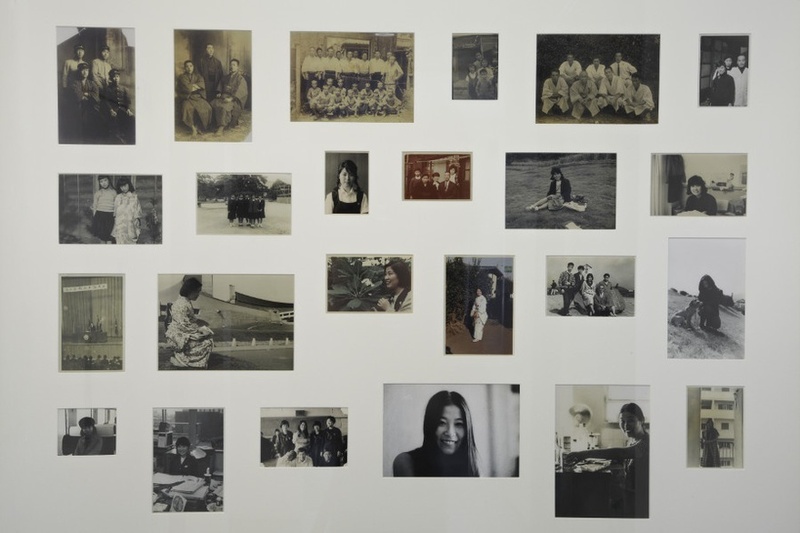 Eric Baudelaire, Fusako Shigenobu Family Album, 2012. 27 photographs circa 1900 to 1973, museum board and wood frame, 103 x 153 cm. Courtesy the artist. AD: And it is also effectively mimicking what Michelin were doing in outsourcing their key product to someone else. Again, this seems to be dealing with the unreality of space as de facto or de jure, hypothetical, imaginative, and speculative. I wanted to return to this notion of disjuncture, this time between the event and the representation of the event, as this is something that I kept coming back to when I was reading around your work. In one particular article there is a discussion about what happens when the event occurs, describing the event as a process where nothing happens, and the difficulty of perceiving something as an event as it unfolds compared to the ‘aftermath’. I was thinking about the origin of the event, the ‘real’ of the event, the aftermath, the experience, and I started thinking about Masao Adachi, who is not only a key character in in some of your films but also a key thinker for you in terms of his approaches. Is this notion of the event important for you? I’m thinking especially of The Anabasis of May and Fusako Shigenobu, Masao Adachi, and 27 Years Without Images (2011). There was a key moment in the film for me where Adachi attempts to compare guerrilla operations with filmmaking. He says that when he was a member of the Japanese Red Army (JRA) and he saw soldiers being sent out that in his head he used to imagine the hijackings that they would then perform or the hostages that they would take and that it wasn’t until after the event, when they came back and explained what had happened, that he could reconcile, or indeed not reconcile, his imagination of it and the real of it. And, to a certain extent, this seems core to how your practice works too. EB: There is a hypothesis that started occurring to me while talking to Masao Adachi: the idea that Adachi was the initial script writer of contemporary forms of terrorism. By that I mean that it is possible to contend that he is one of the first people to understand that the premise of terrorism is not to kill people – it is to occupy airwaves. Prior to his joining of the JRA there had been a very deadly operation where three Japanese suicide volunteers had shot and killed 27 civilians at Tel Aviv airport. Most of them happened to have been Puerto Rican pilgrims to the Holy Land. After 1974, when Adachi joined the JRA, none of the operations that they organized were aimed at killing, they were structured as dramatic events that would appeal to journalistic sensitivities. They were organizing hijackings in a specific way: the passengers would be treated quite decently, the aeroplane would land in a number of different cities, and each time a press release would be read to journalists linking the hijacking to the struggle of the Palestinian people. These events were structured in such a way to be on prime time TV, and not just once but throughout several days, in order to better capture the imagination of the world audience. Eventually the passengers would be freed and sometimes the JRA soldiers would hand out questionnaires asking if everyone had had a good experience with this kidnapping, asking if the passengers understood the relationship between the Palestinian cause and the hijacking itself, if there were any suggestions on how to improve the methodology of the hijacking and so on. There were times when certain things went wrong, and some people did get hurt. But for the most part Adachi –and this is my theory not something that Adachi ever said to me – Adachi was the first thinker to propose a synthesis between cinema and guerrilla fighting, to work with the idea that the spectacle is the real battlefront. I believe he was approaching this question as a screenplay writer does – the screenplay writer doesn’t know what the film is going to be about exactly. The point of the screenplay is to be a trigger, a proposition for actors to embody certain characters, and for a director to give it an image. But in this equation the scriptwriter of the hijacking could be Masao Adachi, the actors would be the soldiers of the JRA, and the camera crew is the world media – it’s a dissociated production. In a way, that is what the JRA invented and unfortunately today this tradition has mutated into these extraordinarily media-aware and quite dreadful YouTube videos that are being produced by Daech as a way of occupying the iconography of the battle. AD: But where you describe Adachi as a screenwriter he also acts as your director in The Ugly One (2013) –there’s a way in which he is directing you both in your overall direction of where you’re going and what you can view but also what you do with that film. EB: I’m interested in collaboration in so far as the conflicting nature of a collaboration can generate what would not occur outside of this relationship. This is the game that I’ve been playing with Masao Adachi for a couple of films. Even Anabasis is predicated on a transaction between the two of us – I ask Masao to tell me his story, he tells me he’s willing to tell me his story in exchange for images that he wants me to shoot for him when I go to Lebanon, because he can no longer travel there. So a seminal transaction is at the surface of the film and it is also one of its subject matters. The relationship between the author of the film and the subject of the film is not a normal, simple subject-author relationship. it’s a relationship that is complicated and predicated on an exchange, a form of mutual manipulation, and this transaction is made explicit. When we decided to work on a second project together a couple of things happened: one is that I wanted to reactivate Masao Adachi as a screenplay writer for The Ugly One. AD: Because he hadn’t been writing for some time at that point and he had been prison in Japan. Eric Baudelaire, The Ugly One, 2014. Installation view, Galerie Greta Meert, Brussels. Courtesy the artist and Galerie Greta Meert. EB: He had not written a script for another director since 1974. The last film was The Ecstasy of the Angels(1972), which is a screenplay about a terrorist organization that somewhat self-destructs in a tempest of bombs and free jazz. It’s quite an incredible film. It’s also the last film that he was involved with before he himself joined a terrorist organization, which is somewhat interesting because the film is not an apology of terrorism, it’s actually a critique of the nihilism of terrorism. So I wanted to reactivate Adachi as a screenwriter. I made a proposition that I would commission a film from him, that I would direct it and he would write it. He answered by saying that it was a good idea but that he would write a film that would be impossible to shoot. He would insert ‘bombs’ inside of the script. He said that what he was interested in was seeing how I would respond to this self-sabotaged script. This is why I like working with Masao Adachi, because he believes that there’s something uniquely creative that comes out of conflict – it’s a playful and joyful conflict. I received the script a few days before starting to shoot and it was, indeed, completely impossible to film. So the exercise became about how I could accommodate the mess with some other form that is improvised with the actors. How I could turn this script inside out. The way I chose to do it was by turning Masao Adachi into a character, which he wasn’t in his own version of the script. So I wouldn’t necessarily say that he’s been directing me. What I’ve been interested in exploring with The Ugly One is the idea that the actors in the film are embodying characters that are trapped in between conflicting directives. What happens if the characters are caught in a conflicting relationship between a director and a screenwriter? Truffaut once said that you should film against the script, and edit against the shoot. I really wanted to take that in a very literal sense, which was helped by the fact that the script was unfilmable, so there was no other choice. And so The Ugly One is about this unresolved narrative impossibility. AD: It also seems to be about disillusionment and, in a sense, failure. If we look at Masao Adachi and terrorism in the 1970s, there was this idealism, and you have captured that certain narrative around the event. What has happened is this utopian idealism has degenerated into a conflict over events and images and their representation; perhaps even the bankruptcy of images themselves. It seems increasingly difficult for a narrative to emerge, especially from the Middle East, that captures any singular political event or any particular political will to achieve a degree of resolution. And that disillusionment seems to override Anabasis and The Ugly One to a certain extent, would you agree? EB: It has been a very important thing for me – I’m from the post-1968 generation. I’ve lived in a world that I’ve inherited from my parents’ generation, and they were a generation for whom there was great promise of a new manner of organizing society. The world that they handed over to us was significantly different to the world they probably hoped to construct. So I have always been very interested in the forefront, or the vanguard, of the most radical expressions of a desire for transformation. This is why I’ve enjoyed working with Masao Adachi. And yet, I don’t want to characterize the work as being about disillusion. I don’t think that is how Adachi sees it and I don’t think that disillusion is the scope through which I want to see this history. There are many ways in which former radicals have transitioned into today’s society. But Masao Adachi’s way is quite interesting. He says a number of different things – for example, he says society considers him an ex-terrorist, but that he doesn’t believe the prefix ‘ex’ applies to terrorism. He accepts that he is a terrorist although many people in his generation would refuse this label – he says, ‘if society labels me this way then this is what I am.’ But at the same time he says, ‘regret is only interesting if it’s turned toward the future.’ And this is a position that I like very much because he says that his generation made a big fire and they did not anticipate the brilliance of it. Today he notices that perhaps this fire has burned those in the following generations because it shone so brightly. But at the same time, there is no reason to regret this; the intent of this fire was hopeful. And the consequences of it are what they are. Regret wouldn’t be productive unless it is about the future and, perhaps for Adachi and I, the nature of our relationship is this cross-generational manner of approaching the discussion of the future. Watch an excerpt from Eric Baudelaire’s film The Ugly One, which featured on Ibraaz in April this year. With a screenplay written by filmmaker and ex-Japanese Red Army faction writer Masao Adachi. The film features Rabih Mroué and Juliette Navis as Michel and Lili, two characters who meet on a beach in Beirut, and struggle to piece together fragments from their respective pasts. Eric Baudelaire lives and works in Paris. He was born in Salt Lake City, Utah, in 1973 and graduated from Brown University in 1994. His work has been the subject of one-person exhibitions at Elizabeth Dee Gallery in New York and galleries in Europe as well as at the Musée de la Photographie, Charleroi, Belgium, and Gallery TPW, Toronto. 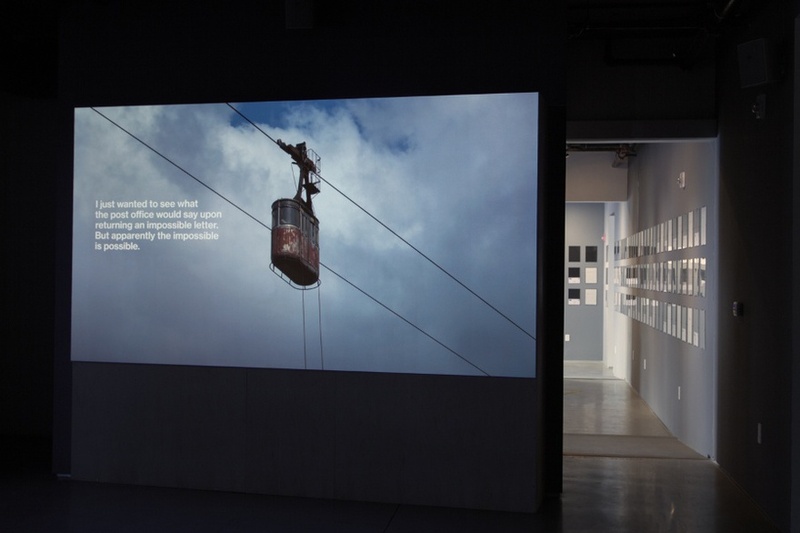 His work has been included in numerous thematic exhibitions such as Concrete Eruditions, Le Plateau / FRAC, Paris, France; Great Expectations, Casino Luxembourg, Luxembourg, France; and Replaying Narrative, Le Mois de la Photo, Montreal, Canada. Baudelaire’s exhibition at the Hammer is his first one-person museum exhibition in the United States. Eric Baudelaire. “Event Horizon: Eric Baudelaire in conversation with Anthony Downey.” Interview by Anthony Downey. Ibraaz. Ibraaz, 29 October. 2015.